This week we have been in Chiang Mai, the largest city in northern Thailand, to attend the wedding of two friends of ours. Both Thai, one of them is from Chiang Mai, so it seemed the perfect setting for them to start married life. 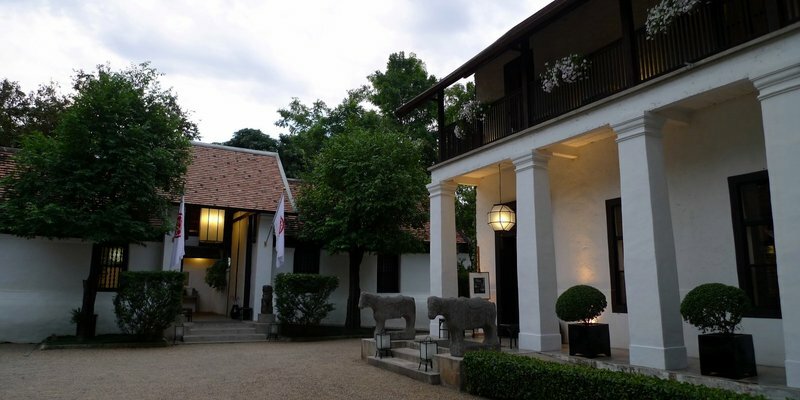 The wedding was held at the Rachamankha Hotel, a 24-room boutique hotel located in the old city walls. The entire hotel was taken over by the wedding party and we arrived a few days early to enjoy the setting. 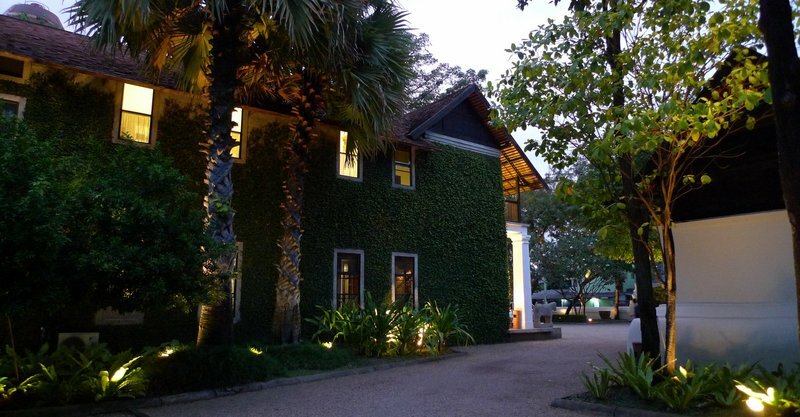 The entrance to the hotel is flanked by a pair of buildings that are designed in an interesting blend of tropical, Chinese, and colonial styles. The interior courtyards echo Lanna architecture, the kingdom that covered Northern Thailand from the 13th to 18th centuries. Most of the rooms line the two courtyards. Ours was to the left. The pavilion in the center offers comfortable seating and nice breezes. One of the front buildings is covered with vines, giving an interesting European feel to the entrance area. The preparations for the wedding started two days before. The grooms’ friends provided many of the services: flower decorations, cupcakes, and in the case of Tawn, designs of the wedding party’s female members’ dresses. 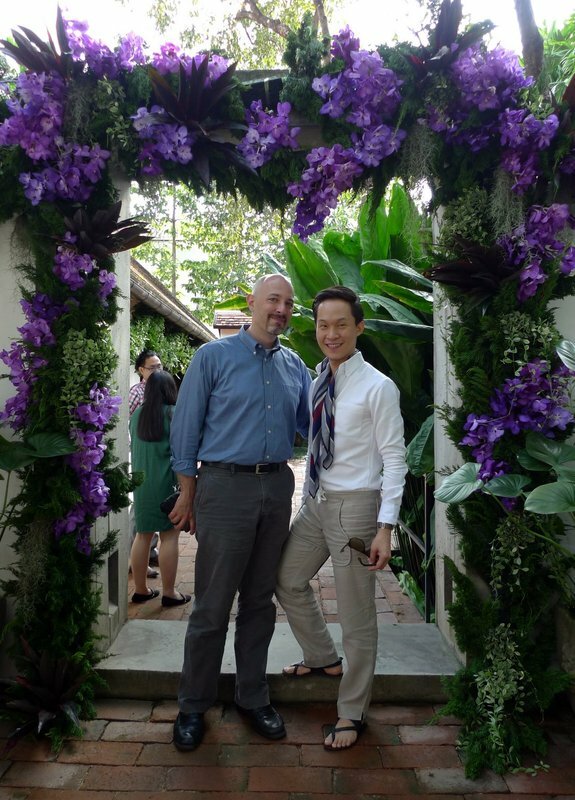 Above, Tawn and I pose with the beautiful floral decorations. 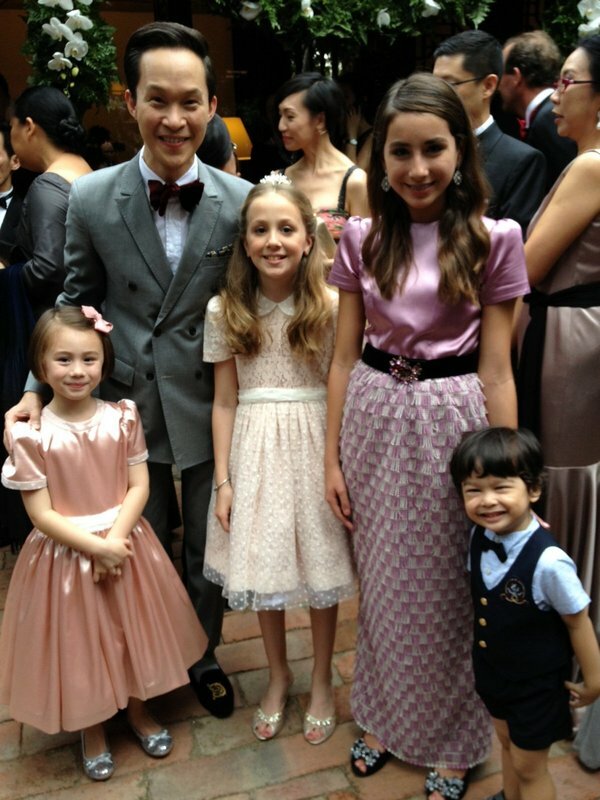 Tawn poses with the nieces (and nephew) of the groom. He designed the dresses for the girls. The day of the wedding began with a traditional Buddhist wedding ceremony. 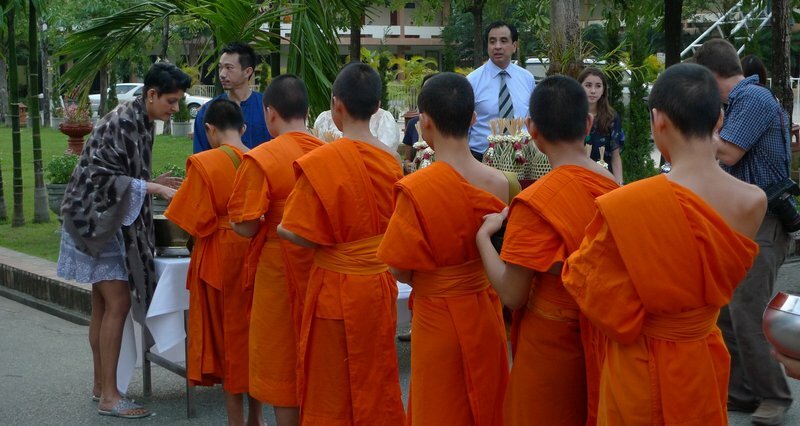 The wedding party and guests walked to the local temple at 6:45 am to feed the monks. 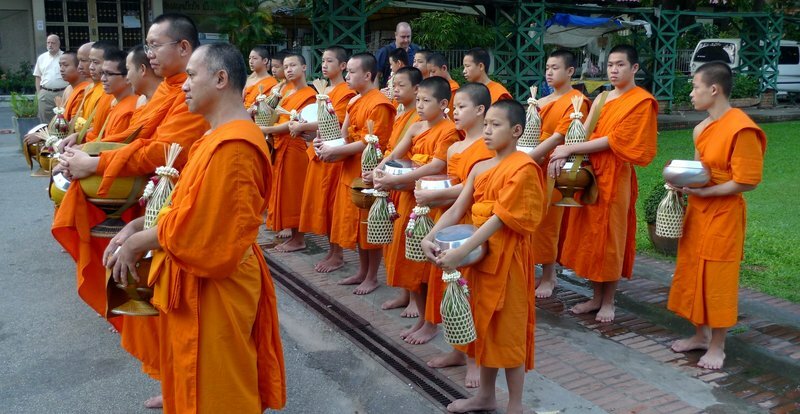 Monks and novices after receiving their alms. They then chanted and blessed the wedding party. We returned to the hotel and later in the morning, performed a traditional ceremony in which the parents and elders pour water over the couple’s hands. 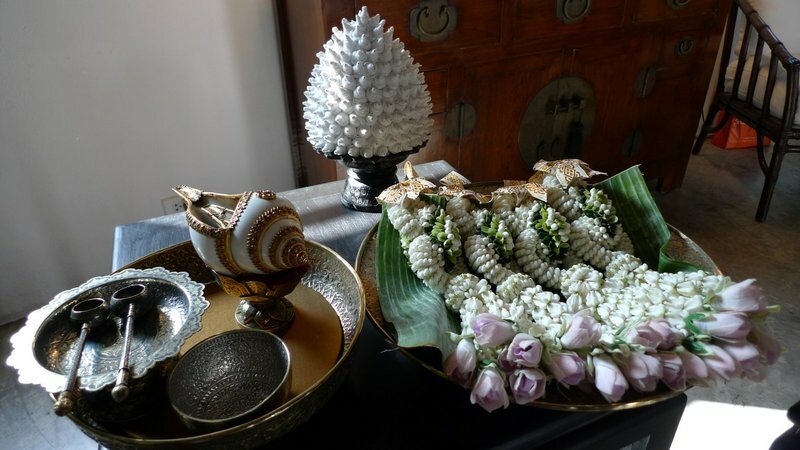 The beautiful puang malai garlands were placed around the couple’s necks. And in a nod to northern Thai tradition, guests tied strings around the couple’s wrists to wish them good luck and happiness. In the late afternoon, a traditional Christian ceremony was held by a friend of the grooms who is a minister. A few minutes before the guests were seated, I snapped this picture of the courtyard that was decorated for the ceremony. The flower arrangements were amazing. The small white flowers in the grasses at the front of the picture were added by the florist. After the service, guests were invited to participate in a loi krathong ceremony, in which small rafts holding flowers, incense, and a candle are launched – usually in a river or lake but we made do with the swimming pool – as a way of sending away bad fortune. 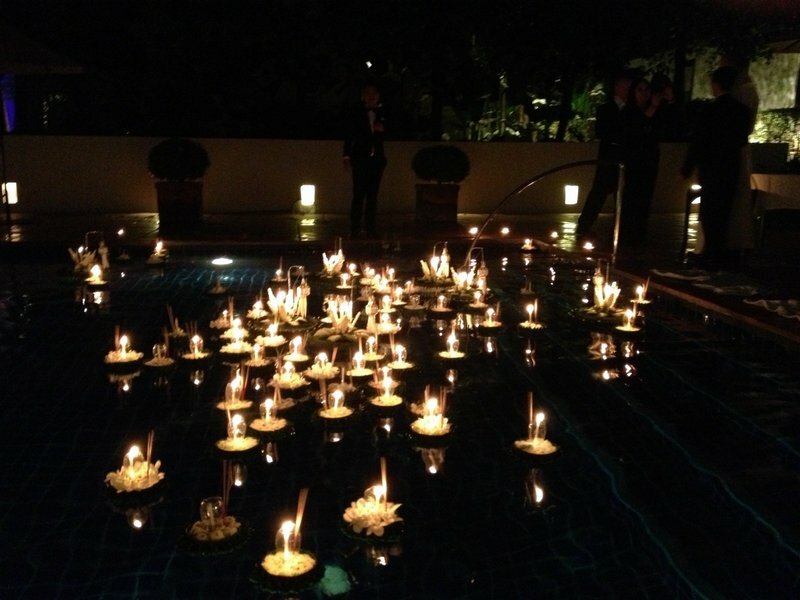 The swimming pool filled with krathong. After dinner, guests participated in another version of loi krathong that is unique to the north: yii ping. These paper lanterns are launched in the same gesture as floating the rafts of flowers, incense, and candles. It is something I’ve always wanted to see in person as it strikes me as very beautiful. Here are two short videos that show the guests launching the lanterns. They will give you a sense of how beautiful the tradition is. This second video is in HD. We had a wonderful time at the wedding, truly honored to be a part of this special moment in two friends’ lives. We wish them all the happiness and a long life together. This entry was posted in Uncategorized and tagged chiang, chiangmai, friends, hotel, lantern, lanterns, loikrathong, loykrathong, mai, northern, paper, rachamankha, Thailand, wedding, yiiping by christao408. Bookmark the permalink. Beautiful photos of a beautiful ceremony. I attended a Buddhist wedding while in DC. I forgot it was an all day affair! I left tired – filled with good food and taking with me a remembrance of a beautiful ceremony. By the you and Tawn make a nice couple under the arch. Lovely – all of it from morning to night. The videos were too cool. Makes me want to attend a wedding like that! Beautiful. That hotel looks like a wonderful place. The dresses are pretty and the little nephew is adorable! Got a question…do I have to watch out for mosquito bites while relaxing in a pool there? This is the most beautiful wedding I have ever seen! Wish mine were like that. I love all aspects of it and the dresses of the girls were beautiful! Your videos are awesome as always too. I have a question about the camcorder you use for these videos. I am looking to buy one and thought to ask if you would have a recommendation for one. Thanks! i love how people blend cultures and traditions together to personalize their wedding day. launching the boats and the paper lanterns must have made for such a beautiful conclusion to a spectacular day! What a beautiful wedding. I love the hotel and I’m trying to remember if it has always been there as a hotel. I remember Wat Phra Singh but don’t recall a hotel nearby. I just checked the hotel website – wow, the rooms are very nice. saw some of the pics last night as you were loading them but I don’t see a picture of the couple here (it’s on the “cover” of albums but it’s not inside). Btw- what happens to the sky lanterns when they land or fall back to the ground? @Kellsbella – Thanks for your kind words. Yes, Tawn is a professional and he did change out of his sandals for the evening celebration. The picture of us by the pool shows him wearing velvet loafers. @Fatcat723 – Thanks for your kind words Rob. Yes, it was a full day in every aspect. @murisopsis – It would be a neat experience for you to attend a wedding like this, I’m sure. @whyzat – Yes, he was quite the scene stealer! @CurryPuffy – Thanks for the recommendation, Gary. Yes, I’m sure there are many pleasant memories of your trips here. You’ll have to bring W and make some more. @Wangium – The mosquitoes don’t seem to be much of a problem during the day but are at night. The hotel had plenty of citronella candles and sprays for us to use. @awoolham – Thanks so much for the recommendation! The first video was shot on my iPhone 4s. The second one, which is better quality, is shot with a Panasonic Lumix LX5. It is a still camera that shoots great video and does very well with low light. @kunhuo42 – Especially here in Thailand where there are regional differences, that blending is neat to see. @ElusiveWords – The hotel is only nine years old so it may not have been open last time you were here. As for the couple, I removed their pictures from my blog in order to protect their privacy. It is on facebook though. This looks absolutely beautiful! I especially love the loi krathong ceremony and the paper lanterns; it reminds me of the movie Tangled lol. wow, such a beautiful wedding. 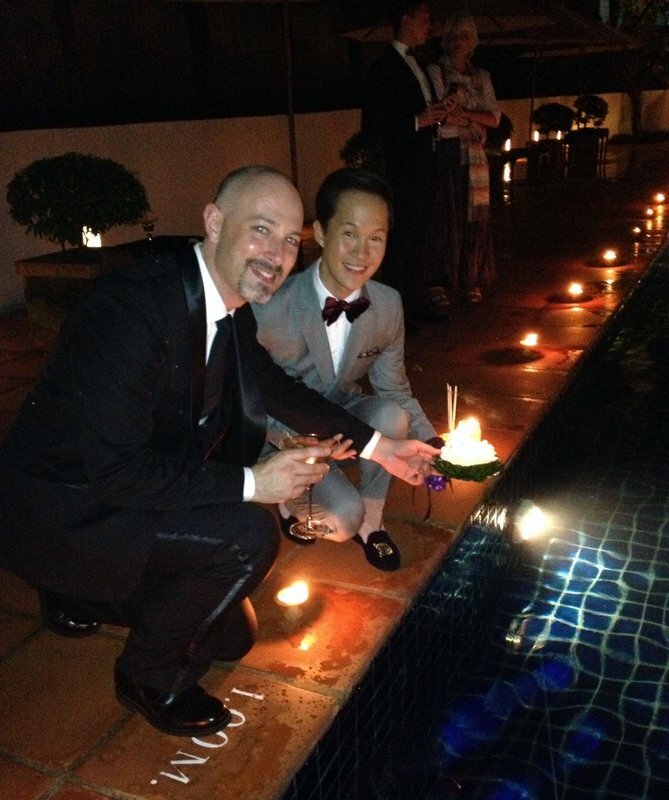 the setting, the krathong and lantern ceremony, all very nice indeed. @CurryPuffy – No doubt you would have stayed here. It is also the same architect as the Tamarind Village, which we stayed at a year or two ago. Very similar look although this place is nicer. @hilabpartnerxD – That’s an interesting thing for it to remind you of! Ha ha! @rudyhou – It was one of the nicest weddings we’ve attended. Beautiful wedding and setting. Thai traditions of pouring water and using the garlands plus the Loi Krathang and Yi Ping ceremonies add a wonderful dimension. The dresses are beautiful as well…Yeah, Tawn!. Thanks for sharing. Beautiful pictures. I am curious about the paper lanterns. What happens to the flame when the lantern lands somewhere? Or does the lantern stay afloat until the flame extinguishes itself after several hours? Beautiful photos of a beautiful wedding. I wish your friends well. I’m sure it was a privilege to be there. @hilabpartnerxD – awww…. 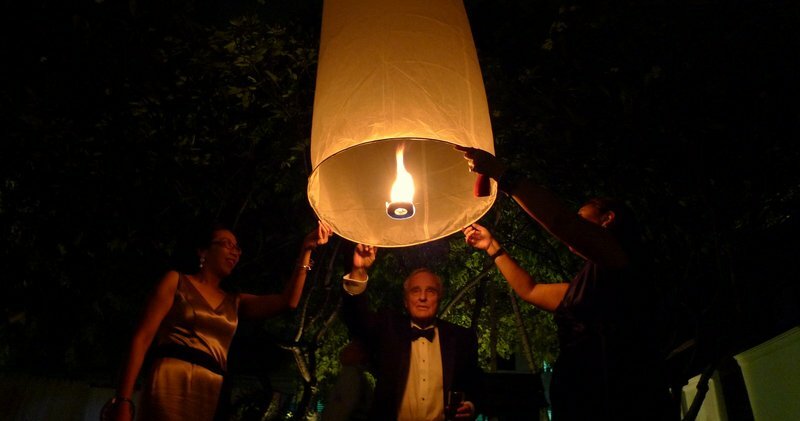 if I get married I want those sky lanterns too… but with big flames, like a rocket. Wow. That is just breathtaking. I especially love the little rafts in the water. And Tawn’s designs are gorgeous. Thank you for sharing it with us. @ElusiveWords – Oh whoops I just realized I replied to the wrong person >< And Like hot air balloons? Amazing photos of this beautiful ceremony and love the videos. @hilabpartnerxD – I wonder if they have a similar festival in Scotland? @ZSA_MD – Generally, the lantern stays afloat until the flame has burned out and then gently sinks to earth. It isn’t the most environmentally friendly event as of course these paper and wire lanterns end up landing somewhere and from time to time, they land on something while the flame is still alight, sparking a fire. @TheSutraDude – Indeed it was – an honor and a privilege. @chronic_masticator – You are most welcome; glad you enjoyed. @Grannys_Place – Glad you enjoyed the photos and videos. Gosh what a beautiful wedding!! Love the raft tradition! I was fearful of coming to your page at such a late hour, where food pics would bombard me and carry me off into the kitchen where demons would tempt me with libations and tasty food….instead i was pleasantly surprised with such a beautiful venue for a wedding. 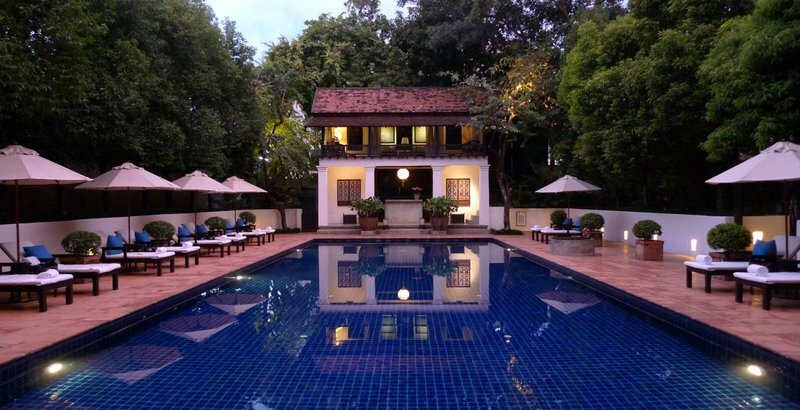 The Rachamankha Hotel is gorgeous! I totally want to participate in the ginormous floating lamp festival in Chiang Mai (http://youtu.be/N9Ko-yvJzHU?hd=1). Definitely one of the things on the bucket list. @AzrihaEatsWorld – And just when you thought you knew what to expect from my blog, right? @brooklyn2028 – It really was beautiful. Some traditions from other cultures are truly beautiful. @greatredwoman – Yes, that is true. Thanks for your comment. Amazing post! So beautiful. It’s neat to learn about other culture’s wedding customs. @uru_n_imi – Glad you found it interesting.